Can dogs detect the early stages of cancer in humans? Man's best friend has always been known for their keen sense of smell, and now this asset is being used in early cancer detection research. 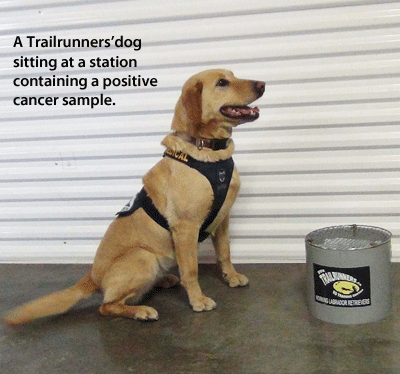 Trailrunners K9 Training Center, located in Saskatchewan, Canada, trains dogs to detect the early stages of cancer through "screen breath samples" collected from patients. Currently at the research phase, the center uses these samples, via a private medical foundation, to train dogs to detect cancer by smelling the breath samples. When the Trailrunners' dogs indicate a "positive" cancer finding, the research team ships the samples to another team of cancer detecting dogs located in Japan for verification. Shipping overseas between locations can cause potential problems such as cross contamination of odors within a batch of samples, especially in the cabin pressure of airplanes. The odor particles are so small they have the ability to permeate plastic and under pressure or certain other conditions, the actual sample can leak the gasses it contains. Because of this, there is potential (since the dogs' noses are so sensitive) for the odor from one breath sample to contaminate another nearby sample, and the dogs would indicate it as a "positive." 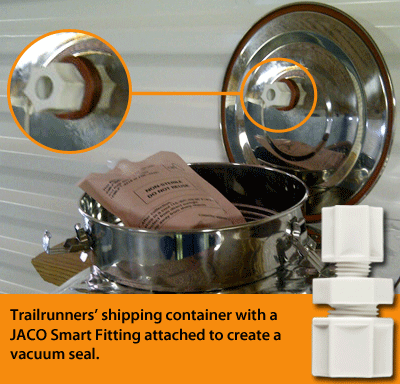 To solve this problem, Trailrunners uses a stainless steel container with a JACO Smart Fitting attached to the lid. The fitting, with a Model #132 Check Valve inserted inside, draws air out of the container and creates a vacuum seal. This fitting enables the team to safely ship samples anywhere and not worry about cross contamination of odors. Beyond Japan, Trailrunners is conducting experimental research with several universities in other countries. Thus, the ability to safely ship accurate samples overseas or even throughout Canada is essential to the success of this research. With this prototype, the Trailrunners team hopes the research proves to one day be an easy and non-invasive cancer screening technique available to the general public. For more information about Trailrunners, visit www.cancerdogs.com.